The weekend before St. Valentine’s Day, this year falling on Monday, has chocolate as one of its best protagonists. Love and chocolate are a perfect match, are they not?! 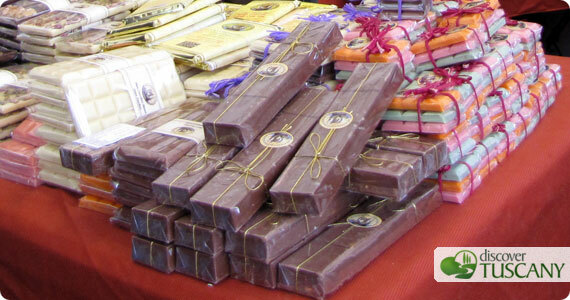 In Fiesole, a short distance from Florence’s historical center, on Sunday you’ll find the “Chocolate Festival”. The stands, located on the central Piazza Mino, will offer specialties prepared by master chocolatiers from all over Italy. Piazza Santa Croce, in the historical center of Florence, hosts until Sunday the sweet temptations of the “Chocolate Fair”. The large square is animated by many stands full of sweets proposed by Italian and international master chocolatiers. From this Friday until Sunday in Livorno you’ll find the sixth edition of the handmade chocolate festival called Chocolandia. Confectioners will involve visitors in tastings, new recipes and tips about chocolate. To celebrate love, the Italian Ministry of Cultural Activities once again proposed a lovely initiative dedicated to all couples. On Saturday and Sunday, couples can visit all state museums, monuments and archeological sites by paying for only one entrance ticket instead of two. Saturday and Sunday in Pistoia, in via dell’ Annona, more than 120 exhibitors will participate to the traditional antiques market. In Florence on Sunday in Piazza S. Spirito you’ll find a small fair with stands offering handicrafts and antique items. On Sunday in Asciano, in the beautiful Crete Senesi, the small Market of the Crete Naturalia will take place. On sale you’ll find local products, organic food, handicrafts and antique items. The characteristic historical center of Barga, in the province of Lucca, will be animated by the stands of a nice market of handicrafts and antiques. Whether you’ re a couple or not, this weekend before St. Valentine’s day in Tuscany reserves a lot of sweet surprises indeed!